BYRD, Harry Flood, (father of Harry Flood Byrd, Jr., and nephew of Henry De La Warr Flood and Joel West Flood), a Senator from Virginia; born in Martinsburg, Berkeley County, W.Va., June 10, 1887; moved with his parents to Winchester, Va., in 1887; attended the public schools and Shenandoah Valley Academy at Winchester, Va.; entered the newspaper publishing business in 1903 and became publisher of the Winchester (Va.) Star; also engaged extensively in agricultural pursuits near Berryville, Va., in 1906, specializing in growing and storing apples and peaches; president of the Valley Turnpike Co. 1908-1918; member, State senate1915-1925; State fuel commissioner in 1918; was elected chairman of the Democratic State committee in 1922; Governor of Virginia 1926-1930; Democratic National committeeman 1928-1940; was appointed March 4, 1933, and subsequently elected on November 7, 1933, as a Democrat to the United States Senate to fill the vacancy caused by the resignation of Claude A. Swanson; reelected in 1934, 1940, 1946, 1952, 1958, and 1964, and served from March 4, 1933, until his resignation November 10, 1965; chairman, Committee on Rules (Seventy-seventh through Seventy-ninth Congresses), Committee on Finance (Eighty-fourth through Eighty-ninth Congresses), Joint Committee on the Reduction of Nonessential Federal Expenditures (Seventy-seventh through Eighty-ninth Congresses), Joint Committee on Internal Revenue Taxation (Eighty-fourth through Eighty-ninth Congresses); died in Berryville, Va., October 20, 1966; interment in Mount Hebron Cemetery, Winchester, Va. Dictionary of American Biography; American National Biography; Heinemann, Ronald L. Harry Byrd of Virginia. Charlottesville: University Press of Virginia, 1996; Wilkinson, J. Harvie. 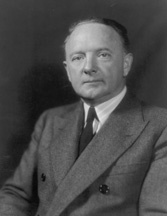 Harry Byrd and the Changing Face of Virginia Politics, 1945-1966. Charlottesville: University of Virginia Press, 1968.